Just select the instrument and style of music you want, and you are given hundreds of professionally recorded music patterns and loops to make music. To add your own flavor to the mix you can modify these patterns or create your own. Then just point and click to trigger different instruments and you're composing your own song. Kinetic features Roland sounds from their genre-defining groove boxes and synthesizers. The Roland name is synonymous with the cutting edge tones of Hip Hop, Dance, and Electronica. These instruments have been used by chart-toppers and underground legends for over 20 years. Just hit play and click these buttons to trigger 64 sections of music with up to 16 instruments each. Kinetic features Roland groove boxes and synths. With Kinetic, these instruments are easier than ever to use: simply select the instrument type you want (drums, bass, leads, etc.) and then select from an assortment of instrument patches. You can play these sounds live with a MIDI keyboard or instrument, or trigger them live with music patterns using your mouse. Play your instruments by choosing from hundreds of professionally recorded music patterns. You can mix and match patterns and also use the included audio loops to create an infinite variety of musical combinations. 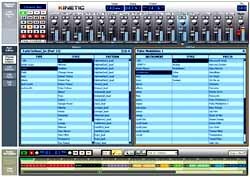 Kinetic helps you find the right pattern fast by intuitively grouping them by instrument and music genre. You can handle the mix by modifying existing patterns or by composing original patterns using the Pattern Editor or Piano Roll views. Kinetic includes all the effects you need to get pro sound. reverb, delay, EQ, filter sweeps, and more. Making songs: just hit record and Kinetic will automatically record as you trigger different sections, change the mix, and tweak your sounds. You can also point and click to arrange songs with your mouse. 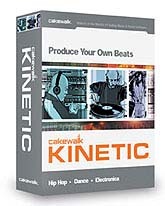 Add audio recording to your experience by connecting Kinetic to Cakewalk Music Creator, Cakewalk Home Studio, SONAR or any other recording software that supports Rewire. Also you can connect with your friends and the music community by exporting WAV files of your mix to burn CDs, or MP3s (Kinetic includes a 30-day trial MP3 encoder) to share on the web. The following sound examples were created in Kinetic using stock instrument patches.